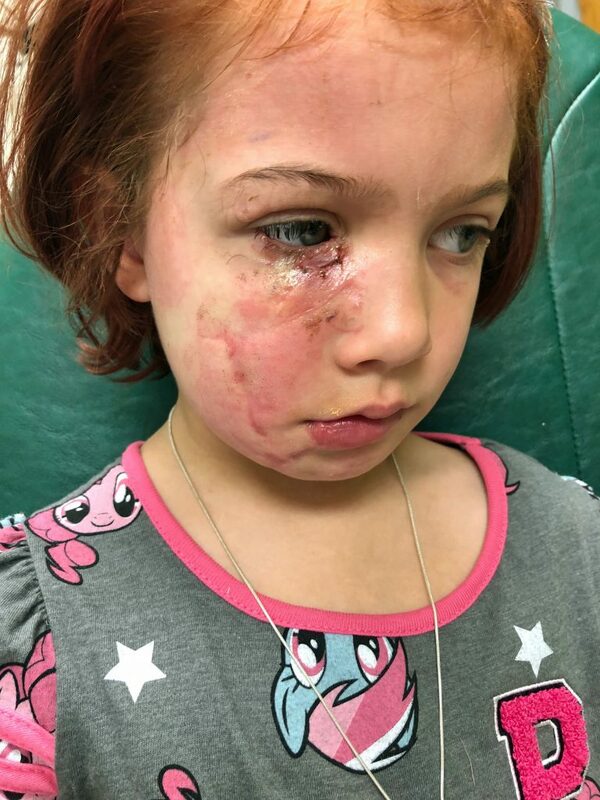 A little girl was left with a shattered jaw and horrific scarring after dogs mauled her face is learning to love herself thanks to selfies. 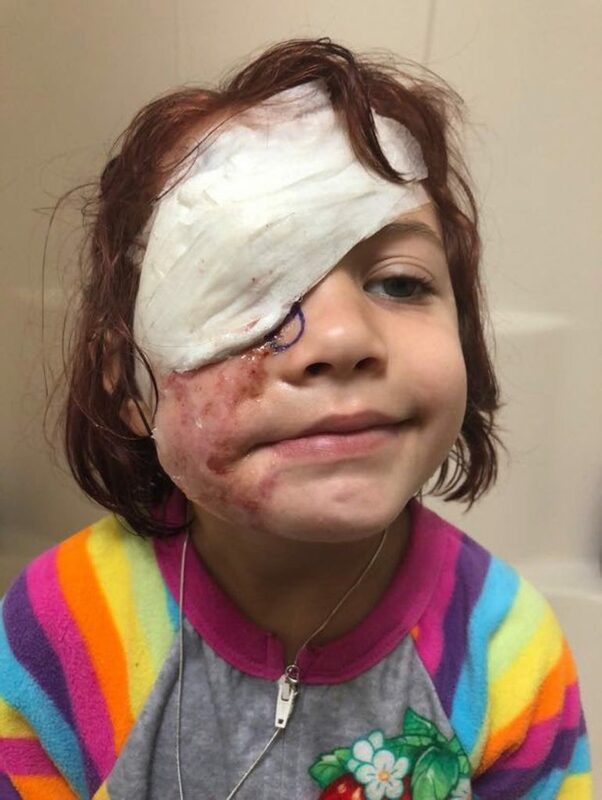 Paige Woody, 41, from Crestview, Florida, USA, watched in terror as two pit bulls grabbed her daughter by the face, tearing her skin and leaving her eye hanging from its socket. She threw herself over daughter, Zoey, 5, as the dogs continued to ferociously snap, gnawing the back of the mum-of-three’s head, damaging her knee and tearing part of her ear off. After rushing to hospital, she was airlifted to a specialist unit to undergo ten hours of extensive procedures to repair her jaw – that had been ‘shattered into hundreds of pieces’ – and to stich her face back together again. She was lucky to survive and went onto have in-depth facial surgeries, dissolvable plates fitted into her jaw and the reconstruction of her upper and lower eye. 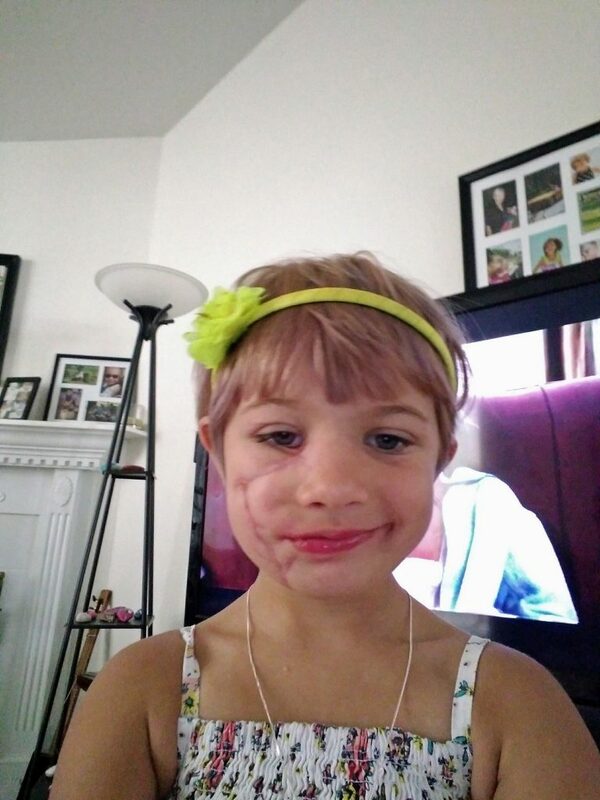 Zoey, now six, is set to undergo her third skin graft next month (April) and is learning to accept the life-altering damage to her face thanks to taking up to 30 selfies a day. Her mum believes the photos, which range from smiles to silly and serious faces, as well as her pulling at her scarring, is helping her to appreciate her differences and track her monthly progress. Paige, a full-time parent, said: “I think the selfies are positive as it’s helping her to understand and appreciate the healing process too. “She constantly takes selfies of herself, she takes around 30 a day while she feels her scars and tries to smile. “She pulls at her face and does different things to take pictures to see if she looks different and is definitely aware of her scars. “Some of selfies are smiles, some silly faces, others more serious and some at different angles. “A couple of times she has asked if she was ugly and of course I tell her it’s not true and that she’s beautiful. “Other people tell her she is beautiful too, which I believe is helping to encourage her to recognise that she is still pretty. “She can’t smile fully because part of her lower lip was completely taken off during the attack, despite having it sewn back on it still droops. “I think taking selfies is her way of understanding. She won’t look in a mirror and avoids them – the only way she looks at herself is through her camera phone. 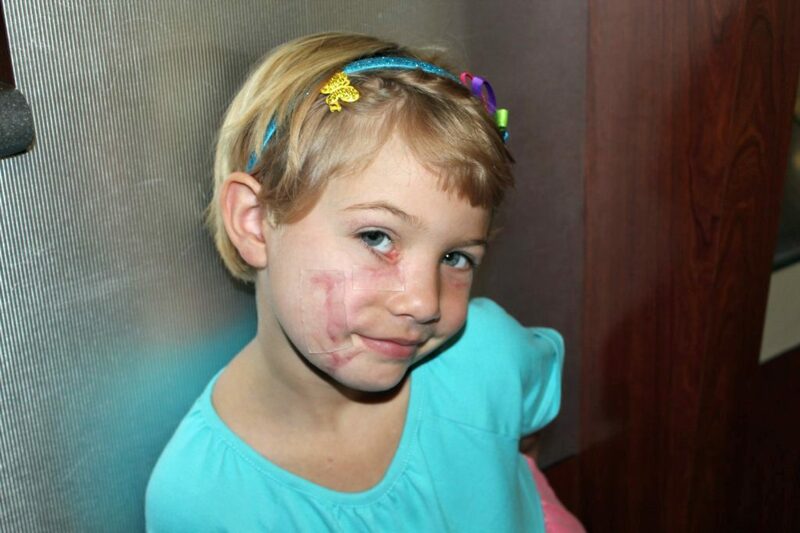 The attack happened last year, when Zoey tapped on the glass door to get her mother’s attention. Upon hearing the noise, one of the two pit bulls that had been playing outside suddenly grabbed and pulled her out of the house. Mum Paige tried to pull them off, before using her body to block the dogs and protect her daughter. She said: “The dog was still attacking Zoey relentlessly and wouldn’t let go, so I threw myself on top of her, shielding my sweet girl from the continuous attack. “As thoughts of losing my daughter spun through my mind, both pit-bulls continued to viciously attack me, causing life threatening wounds to both my daughter and myself. “We got back inside and it was the most horrific thing you could see, I was terrified I was going to lose my daughter. 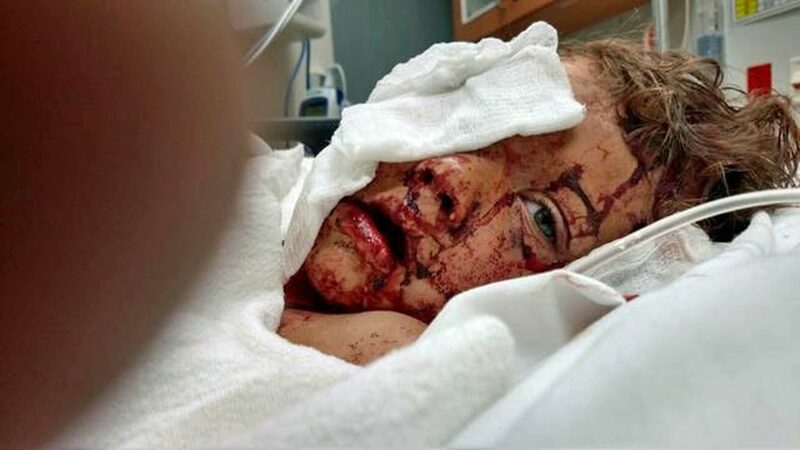 They rushed to hospital where Zoey was then airlifted for lifesaving surgery and Paige treated for deep gashes to the back of her head and other wounds. 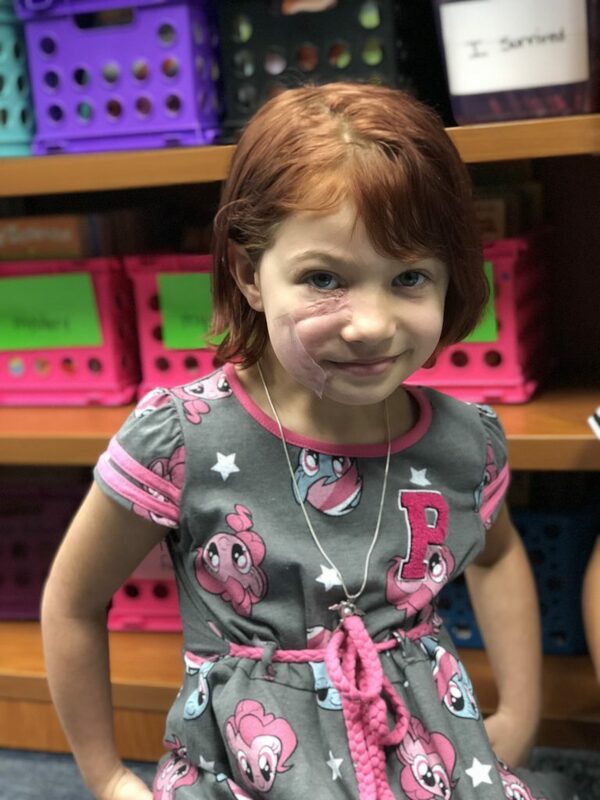 Paige said: “Surgeons put dissolvable plates in Zoey’s jaw, they had to reconstruct her lower and upper eyelid, then put her face back together and sew it up. Since then Zoey has had two skin grafts and is scheduled for a third, with each one she needs additional chemo injections and laser treatment. 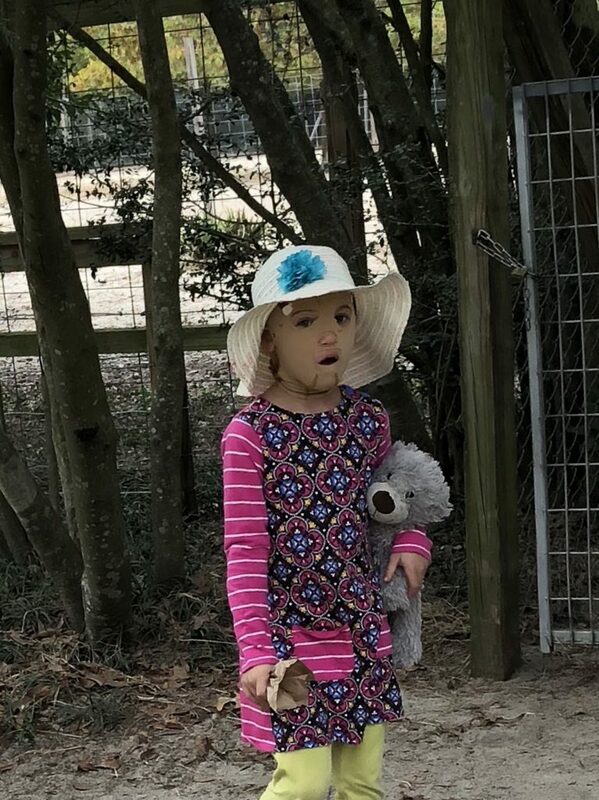 Zoey has to keep out of the sun as UV rays can cause her transplanted skin to thicken – making it harder for future surgeries and for the grafts to take. When she is outside for longer than a few minutes, the little girl has to have silicone sheets applied to her face that help to block the sun and break-up her scar tissue. Paige said: “Her recovery has been ridiculous, she can’t go outside for a year without protection. “The more UV rays that hit her skin, the thicker the scarring will become and harder it will be to perform grafts and for them to take. “She has tonnes of sun hats, glasses and if she is out in the sun for longer than a few minutes I patch her face up with silicone. Zoey was diagnosed with PTSD from that attack that nearly killed her, but thanks to therapy in Galveston, Texas, through the Shriners Club, is becoming more at peace with herself. Paige said: “She was there for a full month with sessions five days a week, it helped a lot because at the time she would never leave my side. “Even if I went to the bathroom she would come with me and would always sleep in the same bed as me. Out in public, Zoey is often quizzed about her facial difference, but the brave little girl has found the courage to explain her attack. The family are continuing to fundraise for the medical treatment and travel expenses, so that she can get the help needed to allow Zoey the best chance of recovery. 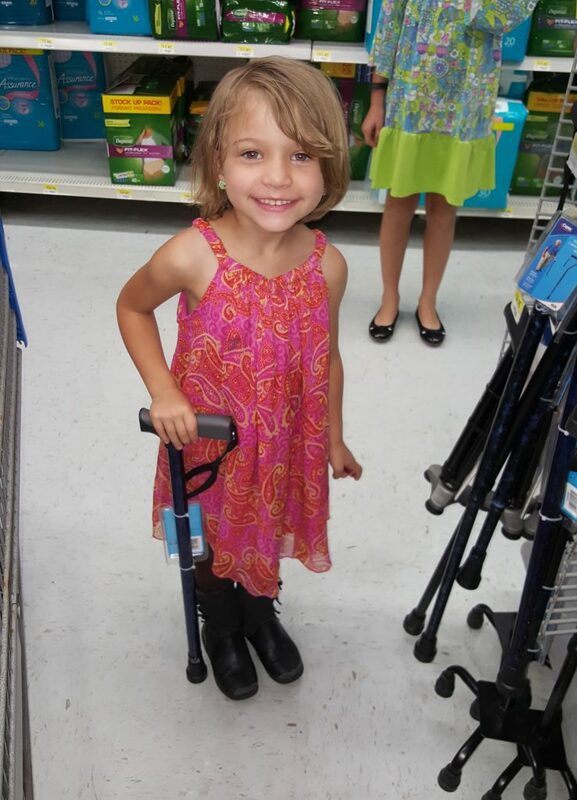 Paige said: “The GoFundMe page is so important to us, every trip we take costs several thousand dollars. “That’s not only for the transportation but lodging and food, then seeking out day care for my two older daughters. “We are gone for so long, you have to uproot yourself for two or three weeks at a time.